Lydia is one of the most prolific and talented “real world” scrappers I know! She makes the most beautiful “everyday life” pages and I love perusing her gallery for inspiration! Let’s take a look at just HOW she gets so much done with some insight into her process! I don’t consider myself to be a very creative person. It’s not something that comes naturally to me. That fact always surprises people because I am very drawn to the Arts. I play the piano, I sing, I have a degree in English, I crochet, and I scrapbook. All of these things are considered to be “creative,” so people just assume that I have a creative mind. But, the thing that really draws me to all of these creative pursuits is the technical aspect of each of them. I can practice and improve my technique to become a better singer or learn a new, challenging piece on the piano. While I was studying English in college, I was naturally drawn to the more technical aspects of the field: literary analysis and editing. I love to crochet, and I’m good at it . . . as long as I have a pattern. I think scrapbooking is one of the few things I do that draws on my creativity in any substantial way. 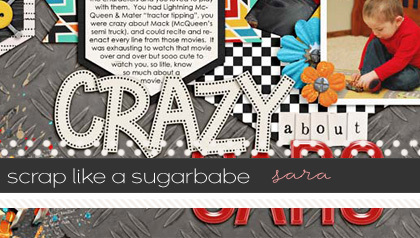 But, being creative is also the more challenging aspect of scrapbooking for me. 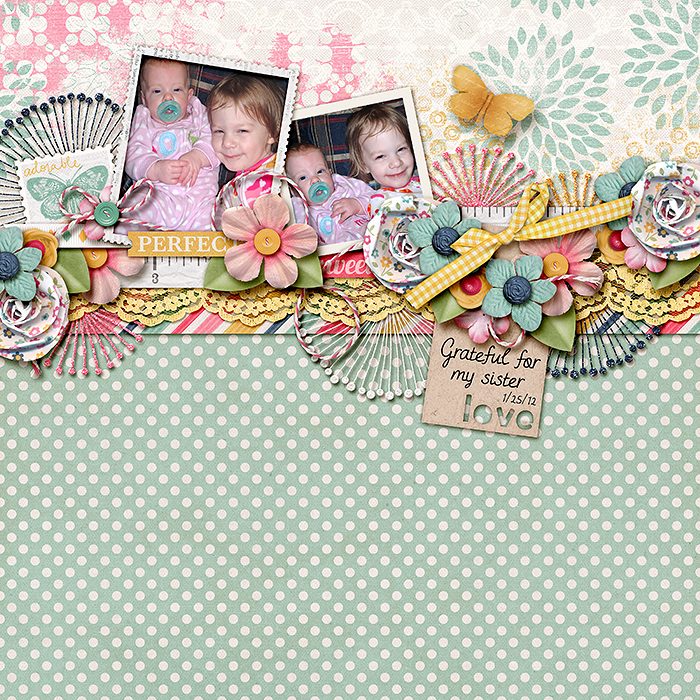 Fortunately, digital scrapbooking provides me with a wonderful blend of the creative and the technical. And, once again, I am drawn to the technical aspects of this wonderful hobby. So, today, I thought I’d share a few tips and techniques that I use when I scrap. I want to preface this by saying that I’m currently using Photoshop CS5.1 on a Mac (CS6 is going to be installed any day now :)). Some of these tips may not work quite the same way if you are on a Windows machine or if you are using different software for your scrapping. Also, I recognize that everyone has their own style. My workflow may not suit your scrapping style. But, I hope that you’ll be able to glean a few good ideas to help streamline your scrapping just a little bit. I’m a kit scrapper for the most part. When I begin a layout, I like to have all the papers and elements from the kit I’m using on my layout. A few years ago, I heard about a script called AV Bros. Collector, and I use it on every single layout I do. 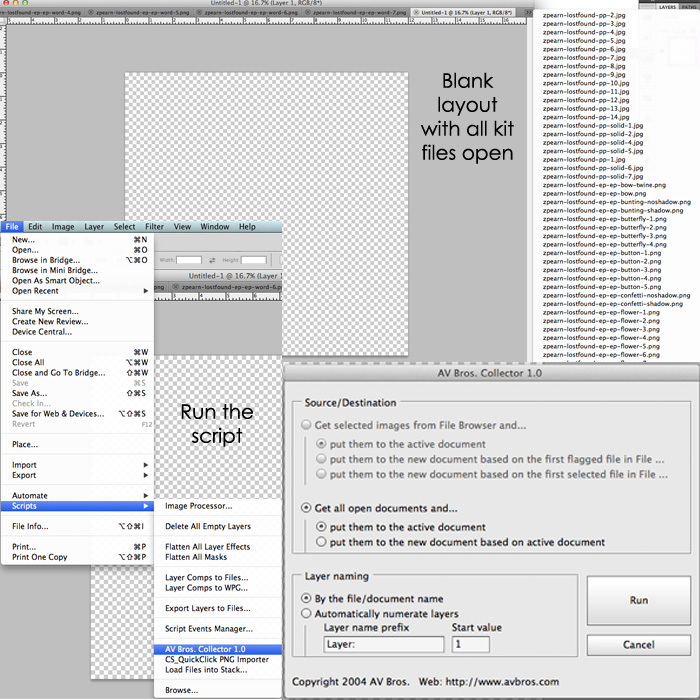 I open every file from a kit, then open a blank layout and run the script. 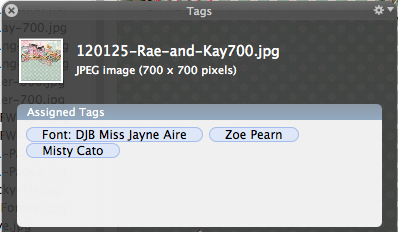 It collects all the open files and puts them on my layout and renames the layers with the original file names. This is something that comes in really handy when I’m trying to keep track of my credits (which I’ll talk about later). Once I have all the papers and elements on my layout, I get to work moving things around and creating. Of course, I usually find that I need to add an additional element or an alpha to my layout. To add individual pieces to my layout, I created an action that uses the AV Bros. Collector script. I open the file I want to add to my layout and run the action. It uses the script to place the element in my layout and rename the layer, and then it closes the original file – all in one quick click of the mouse. And, speaking of actions . . . I love actions! I create them for all sorts of different processes. I have created actions for so many different things, but I want to tell you about a few of my favorites. 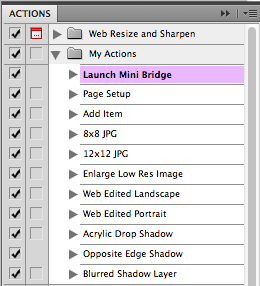 I recently upgraded the version of Photoshop that I was using and discovered the Mini Bridge. I fell in love instantly. But, to use the Mini Bridge, you have to open the Bridge application. So, I created a simple action that opens Bridge. Now, it’s just as easy to actually open Bridge as it is to run the action, right? 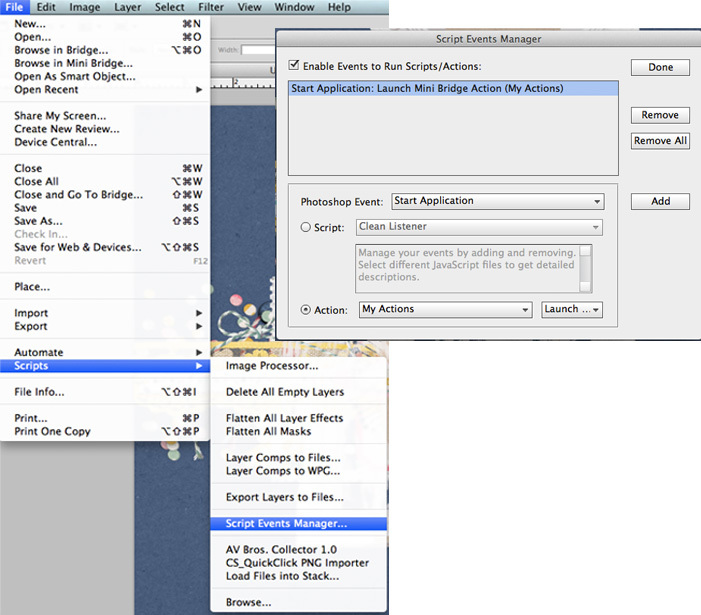 But, using the Script Events Manager, I set things up so that when I open Photoshop, my Launch Mini Bridge action automatically runs, opens Bridge, and Mini Bridge is all ready to go right from the start. We all know that shadowing acrylic elements can be a little tricky. 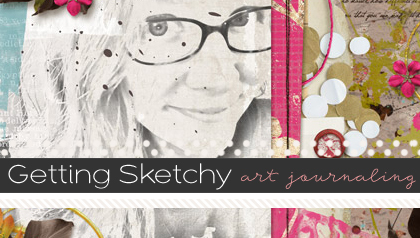 Jessica Sprague created this tutorial on a great technique for shadowing acrylic elements. Once again, there are lots of steps here, but they create a great effect. Actions to the rescue! 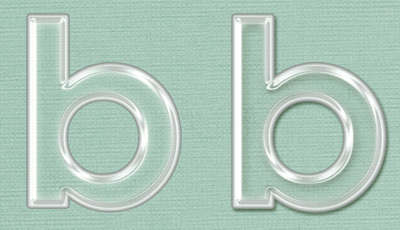 My favorite thing about this action is that it uses one of my own drop shadow styles. And, I can even go back and apply a different drop shadow style after the action has run and still maintain the transparency on the acrylic element. Don’t you all love the fact that we can upload 700×700 layouts here at SSD? I adore the larger size and can’t wait for the day when all the digi galleries allow for larger images. 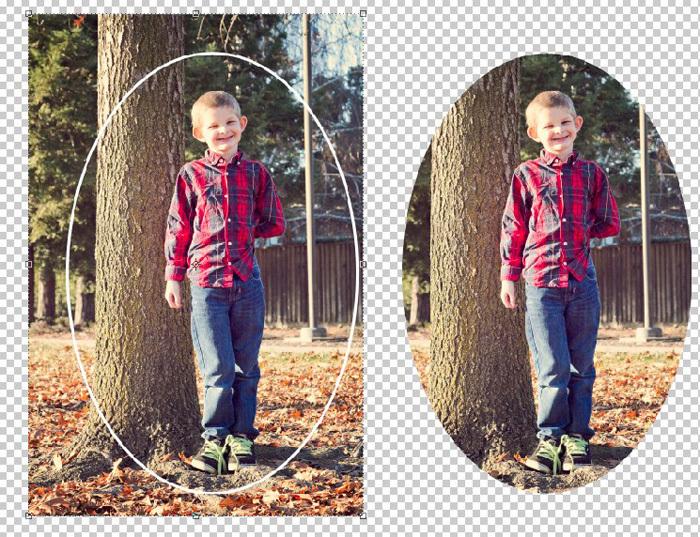 But, until that day, I’m saving most of my layouts at two different sizes (one at 600×600 and one at 700×700). Now, I’ve been using an action to sharpen my layouts and Save for Web for a long time. But, when I started saving two different sizes, I had to rethink my action as well. 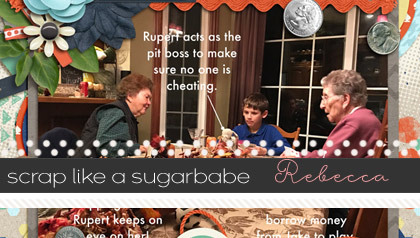 One of my fellow Sugarbabes pointed me to a free action from Secret Stash (sorry, it’s no longer available) that would resize, sharpen, and save a layout at 600×600 px. Well, I took that action and tweaked it. And now, I have an action that resizes to 700×700 pixels, sharpens, and saves for Web. Then, the action stops so I can return to my full size flattened file. At that point, I can restart the action, and it does the whole process over again (this time at 600×600 pixels). It’s a click saver for sure! Tracking credits is a topic that is discussed in the forums pretty regularly. It seems there are as many methods as there are scrappers. But, I’d like to share my method with you now. Remember that AV Bros. Collector script that I love so much? A big part of the reason is that it renames each layer to match the file name of the element, paper, or alpha that is on that layer. I use this in a couple different ways to track my credits. 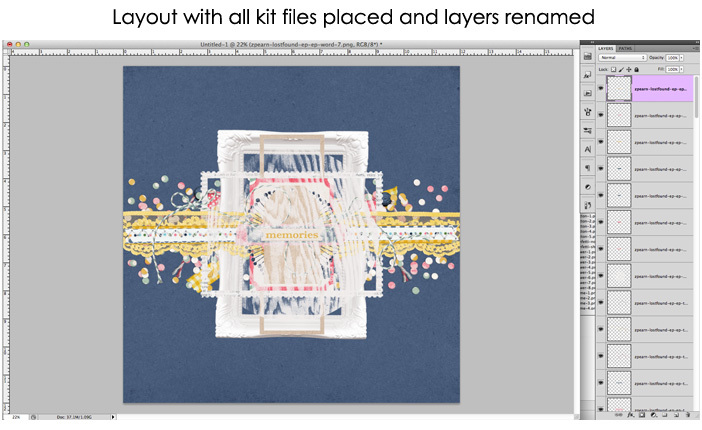 With my layers all named correctly, I can open the File Info on my layered .psd files and quickly see which kit I used on that layout. 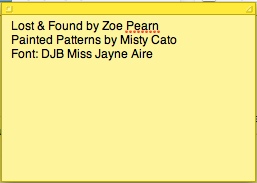 Once my layout is finished, and before I flatten it, I use my electronic sticky notes to type out my full credit list. Having my layers already named makes it easy for me to scroll through the layout and complete my credit list without having to go through my stash and remember everything that I used. Once I have my credit list typed onto a sticky, I copy and paste it into the Spotlight Comments of my Web sized layout. Since this is the file that will be uploaded into online galleries, I like to keep my credit list attached to that file. Many of my layouts are created for my CTs, so I’m not uploading them until a few days after I have created them. When I’m ready to upload, I open the File Info for the Web version of the layout and copy and paste the credits into the gallery. No searching around for credits. Yay! To make it a little easier to find layouts if I need them at a later date, I also use Tags to add keywords to my Web sized versions. I tag them with the names of the designers whose products I’ve used and the names of the fonts in the layout. That way, I can easily do a Finder search to find layouts with products from a particular designer. Whew! Are you still with me? That was a lot of information, and it only scratches the surface of all the amazing tricks available, but hopefully you learned a little something new. And, if you made it this far, I have a little gift for you . . . a few of MY actions. These are all actions that I have created myself. Some of them are based on tutorials or other actions that I have downloaded as freebies. But, they were all created from scratch by me. Also, depending on the version of Photoshop that I used to create them and the software that you are using, they may not work for you. I can assure you that they all work for me, but I haven’t tested them on any other software, so I can’t guarantee what success you will have. If you have any more questions about specifics, I’m happy to discuss things in more detail in the forums or via PM. I’m still as much in love with this hobby of ours as I was when I first discovered it. And, that is due, in large part, to the fact that I can stretch and use my creativity while indulging the technical, analytical part of my brain. It’s the best of both worlds! This is an amazing article, Lydie. If I were to start scrapping, I’d have to go further back than you do here to learn how to get started. But for a scrapper who already knows the basic basics, this would be a treasure. 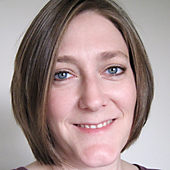 Thanks for the actions Lydia – neat to see how you save time during scrapping! I’m sure to read through this profoundly when I’m back from vacation, and I’m curious to try out that script you mention. Nice article, Lydia, thanks. Lydia – I think your method is brilliant and thank so much for sharing it! Thanks for the actions, Lydia! I’m expecially excited with the enlarging one! I’ve actually used that built-in script before, Krystal. 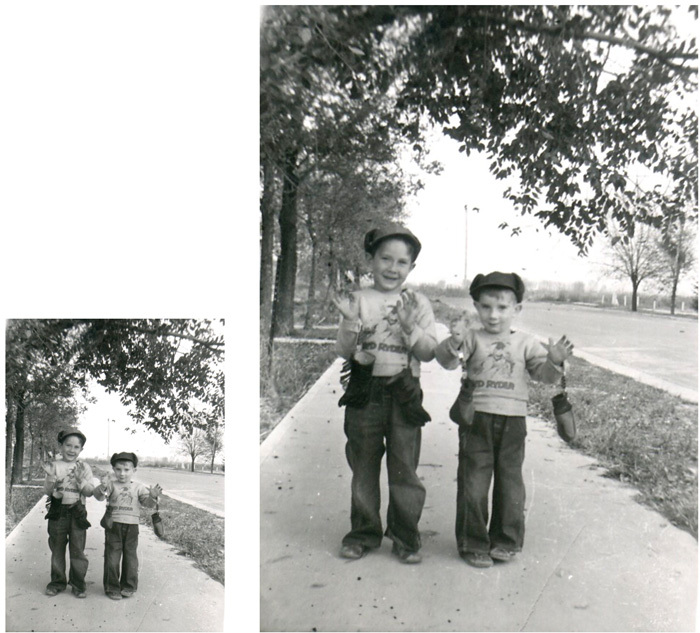 But, there was something about the AV Bros script that I liked better. It’s been a while, so I can’t even remember what it was. But, this is definitely a good tip, because people have different preferences, and this might work better for some. I just wanted to let you know how much I use the tutorial from Digital Scrappers that was dated August 6, 2013 Feathered Marquee Masks. It will continue to be one of my very favorite ways to handle the background. Thanks for such a great and easy technique. Thanks a lot for the tips, tuts and actions! Thanks for the actions, Lydia! Brilliant, I learned so much and thank you for sharing the actions as well! !